Lochaline has always had a large volume of visiting yachts but unfortunately with most of the good anchorages being located away from the village and its facilities it was difficult for visitors to come ashore in great numbers. Informal observations throughout summer 2006 (Mid May-Mid September) indicated that there were an average of 19 visiting vessels entering Lochaline every day during this period, using an estimate of 3 persons per visiting boat this equates to almost 7000 visits during the main summer months. While this figure drops off rapidly during winter months there are still many sport dive boats and sport fishermen operating out of Lochaline throughout the winter months who have expressed interest in safe berthing facilities. 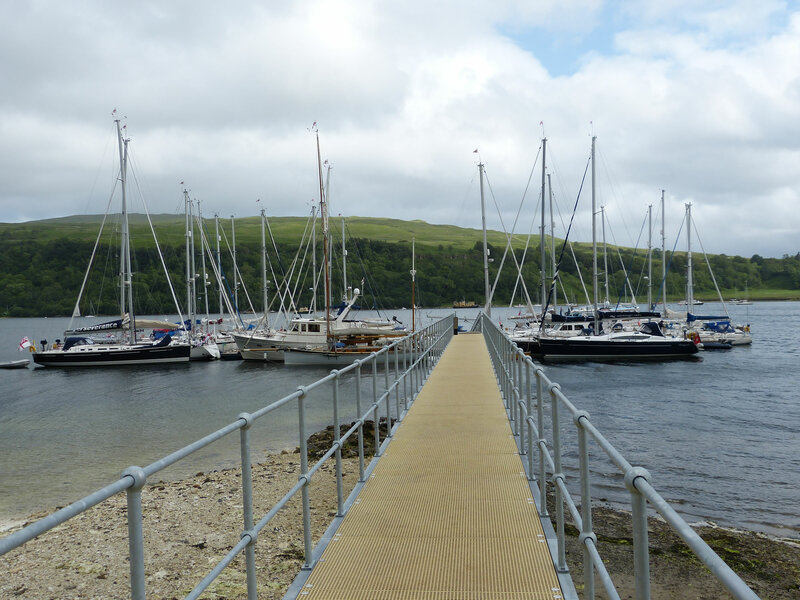 A suitable site was located and the pontoons are located at the closest feasible point to the village enabling visitors to take a 10 minute stroll along the loch side path to access the village facilities. 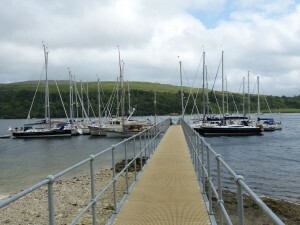 Cala Loch Àlainn visitor pontoons opened in July 2011 and provide 24 visitor berths within a short walking distance of the village of Lochaline. We would like to extend our thanks to our funders – Sail West Project led by Donegal County Council that is funded by the EU ERDF INTERREG IVA Programme for Ireland, Northern Ireland and Scotland 2007 – 2015 and to our other principal funders – Highlands and Islands Enterprise and the Highland Council.